For the first time, a gay male superhero will have his own ongoing solo series from a mainstream comic book publisher. Today DC Comics announced its list of continuing and new titles that will make up the DC Universe when a new direction for the comics publisher’s characters begins in June. 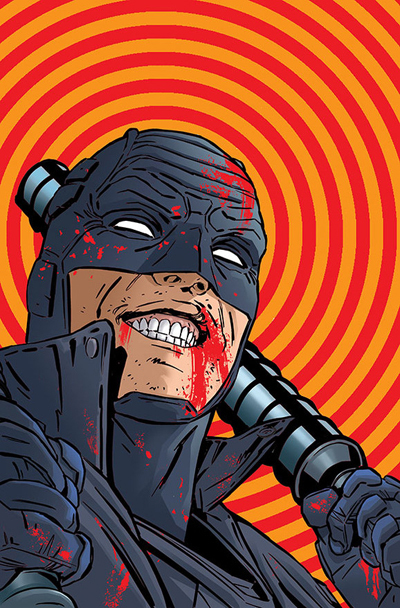 Among the titles announced was Midnighter (written by Steve Orlando with art by ACO), starring a gay superhero who was originally introduced, along with his longtime male lover, Apollo, in 1998 as part of DC’s Wildstorm Comics imprint, where characters lived in a separate universe from iconic heroes such as Superman, Batman, and Wonder Woman. However, the out heroes were both integrated into DC’s mainstream universe when the publisher rebooted its entire line of comics with all new number 1 issues in 2011, where both Midnighter and Apollo were given prominent positions on the superhero team Stormwatch. Though Midnighter did have a previous solo series published under the Wildstorm Comics imprint, the announcement of the character’s new ongoing solo series marks the first time in history a gay male superhero has been given his own monthly solo title in a mainstream publisher’s superhero universe. DC previously made history in a similar way when the lesbian superhero Batwoman was given her own ongoing monthly comic in 2011. However, DC announced in December that Batwoman would be canceled in March along with 13 other titles as the company heads into its upcoming Convergence crossover, which will end in a new status quo for the DC Universe. While the news of Batwoman’s cancellation is a step back for LGBT representation in comics, there will be no shortage of high-profile queer characters in the DC Universe. In addition to Midnighter, the bisexual master of the dark arts, John Constantine, will once again be the star of his own series when the new title Constantine: The Hellblazer (written by Ming Doyle with art by Riley Rossmo) also arrives in June. Several other gay or bisexual characters, such as the gay Green Lantern of Earth 2, Alan Scott, gay Teen Titan Bunker, and bisexual antihero Catman in Secret Six, will all maintain prominent positions in their respective team books.